A pas de deux from The Firebird Ballet. The Finale of NYCB’s Firebird. The New York City Ballet winds up its residency with the complete Coppelia. Phoebe Fennell sings Norina in Don Pasquale for the Lake George Opera. Don Pasquale chorus at Lake George Opera. 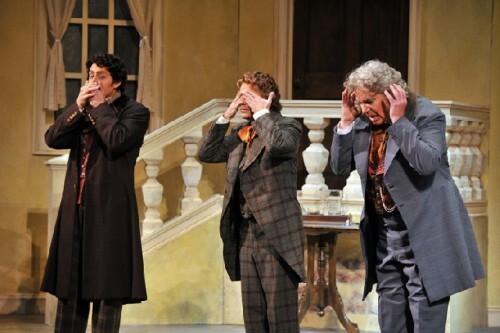 Hear, see, say nothing from Don Pasquale, at Lake George Opera. 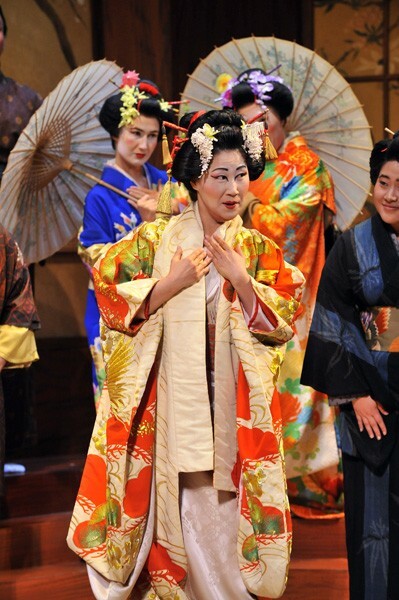 The arrival of Cio Cio San in Madama Butterfly. 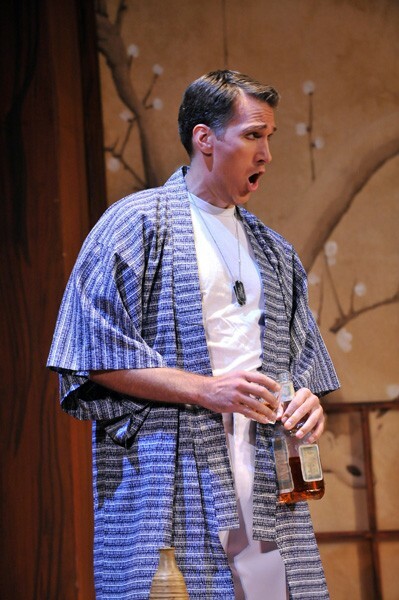 The American, Pinkerton, in his happy coat from Madama Butterfly at Lake George Opera. Suzuki, Cio Cio San and Sorrow from Madama Butterfly. The children showed off their steps before the main performance. L. White Photo. 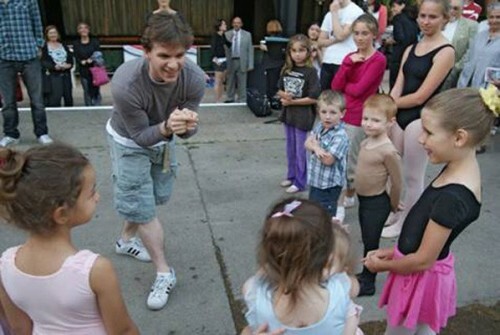 Principal dancer Daniel Ulbricht coached the youngsters in the audience. L. White Photo. Daniel Ulbricht in performance can reach amazing heights. The Spa Little Theater where Lake George Opera and the Chamber Music Festival performs. The SPAC amphitheater from the main stage. The SPAC amphitheater holds 5200 plus many more on the lawn. 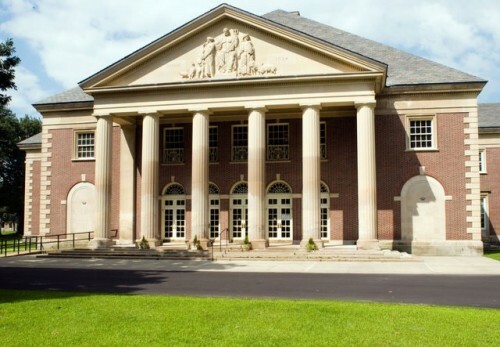 The Saratoga Performing Arts Center (SPAC) kicked into high gear this week as the New York City Ballet (NYCB) took up its annual residence Tuesday and performs every night through July 18. This year NYCB's program at SPAC focuses on the works of the Russian masters, as well as saluting the founding choreographers, George Balanchine and Jerome Robbbins. 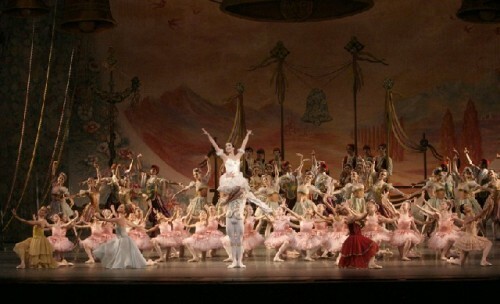 The full length ballet Coppelia will close out the ballet company's summer season. 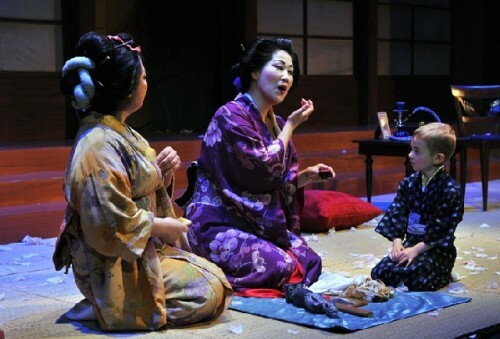 The Lake George Opera concludes its residence on July 11, performing fully staged productions of Puccini's Madama Butterfly and Donizetti's Don Pasquale. An opera workshop production of Eleanor Roosevelt with music by Parshall Vehar is a highly anticipated event. Following the NYCB the busy schedule includes the Mark Morris Dance Group (July 20-21) and a week of pop music which includes Crosby, Stills and Nash, Coldplay, Lil Wayne, Nickelback and Jackson Brown. Classical music returns with the arrival of The Philadelphia Orchestra on August 5 and the annual Chamber Music Festival with top name soloists on August 4. Pop music returns on August 25 with the arrival of Bruce Springsteen, followed by The Moody Blues, Blink 182, Crue Fest, Journey and Toby Keith. For any Berkshire resident who looks at our bi-weekly entertainment previews in BFA, even thinking of leaving the area for a dance or music performance seems, well, heretical. After all, we have the magnificent Jacob's Pillow Dance Festival for dance, and Tanglewood for music, classical, pop and jazz. But here are the differences. If you love ballet, you are not going to see too much of that at the Pillow, and certainly not the work of George Balanchine and the NYCB, arguably the best dance company in the world. So a trip to New York City or Saratoga is in order. From Williamstown or North Adams you can make SPAC in about an hour and a quarter, about the same time it takes to get to the Pillow or the Mahaiwe in Great Barrington. Under two hours from Pittsfield. And a lot less time than a trip to the Big Apple. Directions and Parking The stage there is simply huge, as is the amphitheater which seats 5200 people. Thousands more take to the lawn, the record being 40,000 for a Grateful Dead concert years ago. The Little Theater where the Lake George Opera performs, and the Chamber Music Festival takes place is much smaller at 496 seats. It is more intimate, with good acoustics which enables the music to be heard unamplified. The hall was built by the WPA back in the 30's as a doctor's lecture hall and the seating is a bit cramped, built for the smaller bodies of 75 years ago. But the sight lines in the balcony (really more like stadium seating at a multiplex) are absolutely superb. On the campus of SPAC is a wonderful buffet-restaurant in the Hall of Springs which gives the eateries in downtown Saratoga a real run for their money. It operates during the Ballet and Orchestra seasons. You can call for reservations 518.583.3003. The Wednesday, July 8 performance was preceded by special activities for young dancers, called Junior Ballerina Night. Designed as a way for young dancers to experience ballet, youngsters were invited to wear their dance outfits, and to take a bit of class with the apprentices and dancers from the company. 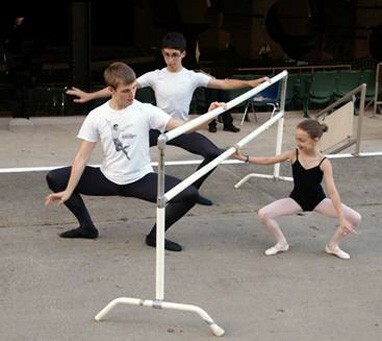 For this they actually hauled out portable ballet barres before the show and set them up on the periphery of the lawn. This was followed by principal dancer Daniel Ulbricht leading a 30-minute Children's Workshop to let young people experience the connection between movement and storytelling. Watching him at work it was immediately apparent why these workshops are a popular pre-performance program that NYCB offers during its regular season at Lincoln Center. Possibly the shortest dancer NYCB has ever elevated to principal status, it is easy to see why. He is daring, a risk taker. When asked what his favorite step was, he immediately launched himself into the air for a double tour with a spectacular landing on one knee. Not impressed? Consider this: he did it on a concrete surface, not a stage designed and prepared for dance. The full impact was absorbed by his ankles and knees. A few degrees off, and it could have been a career buster. Anyway, while all observers agree that his aerial work with its jumps and turns are spectacular, his role as one of the sailors in Fancy Free (the shortest) actually makes the piece more interesting, sort of the way a younger brother likes to tag along with the older crowd. 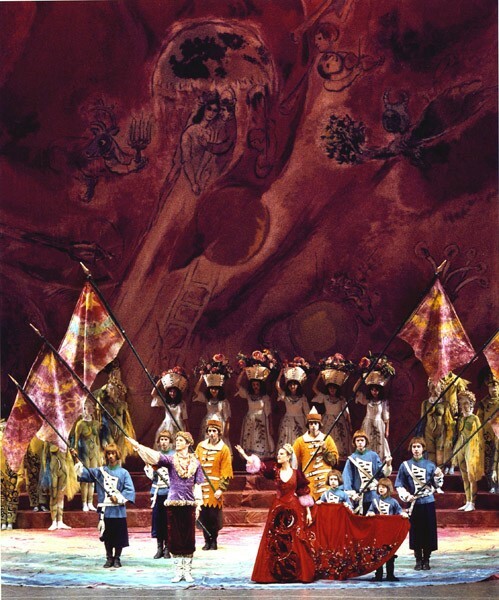 But the conventions about height are also the source of casting problems for him - many of the principal women dancers are taller than him, and this is a no-no. Besides, a ballerina en pointe adds six inches to her height. In his spare time he reads the WSJ for investment advice, and while others in the company use their time off for relaxing, he accepts teaching gigs elsewhere in the northeast. He is a go-getter. NYCB has generally frowned on promoting its stars (yet we all know who they have been in the past) but has had trouble in recent years maintaining the high audience levels it has enjoyed for several decades. Perhaps it is time to rethink that policy. A classic program opener is Balanchine's elegantly simple Concerto Barocco, which is performed to Bach's Double Violin Concerto in D Minor. The first and biggest surprise of the evening was the orchestra under the direction of Maurice Kaplow. This was not some Karaoke taped performance but a real, live symphony orchestra of what looked to be 40-50 instrumentalists. What a joy to hear live music with live dance again. So often performances are rigidly dictated by recorded music which locks tempi in place and prevents that wonderful musical ingredient called rubato, the spontaneity which makes a live performance so exciting. The result is a display of instrumental skills along with those of the dancers, and the two together make the NYCB absolutely breathtaking to both see and hear. Teresa Reichlen, Ellen Bar and Justin Peck were pure perfection with clean lines and crisp combinations that provided an ever changing kaleidoscope of evolving movement. The Cage, which was the piece Daniel Ulbricht had set on the junior ballerinas in the pre-show demonstration, is a Jerome Robbins creation, set to Concerto in D for String Orchestra by Igor Stravinsky. The main dancers were Wendy Whelan as the Novice, Rebecca Krohn as the Queen and Sebastien Marcovici and Adam Hendrickson as the Intruders. With a crouch of their bodies or a thrust of their arms or legs they portrayed a nest of insects, partly creepy, partly regimented. The colony of female creatures quickly disposed of the male invaders. Other Dances was also created by Jerome Robbins for two dancers he admired - Natalia Makarova and Mikhail Baryshnikov, using four mazurkas and one waltz by Chopin in this work. The dancers, Tiler Peck and Gonzalo Garcia shared the stage with pianist Cameron Grant. The duets were sparkling and liquid, making one to think of Saratoga water, of all things. Peck's variations were muscular and well grounded while Garcia's were deftly handled with close to perfect lines. The highlight of the evening was Stravinsky's exciting Firebird ballet for which Balanchine and Robbins each contributed choreography. 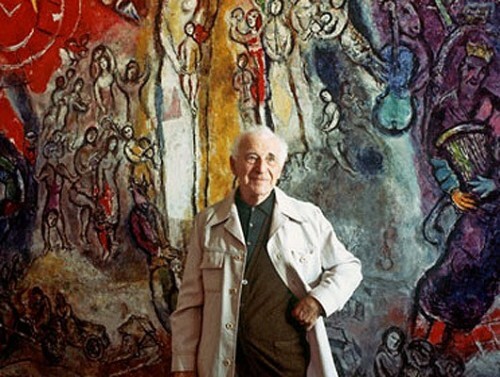 The scenery and costumes were designed by artist Marc Chagall and looked magnificent, with dramatic lighting to highlight their surfaces. Ashley Bouder danced the twisting undulating Firebird, and Jonathan Stafford the dynamic prince. 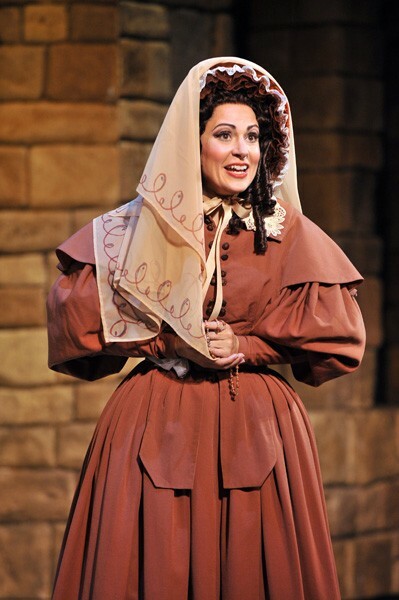 Dena Abergel was gorgeous as the Prince's Bride. This Firebird is a truncated version, not the three act ballet Diaghilev commissioned Stravinsky to write. Over the years both Balanchine and Robbins have tinkered with its choreography, this version being the one Robbins recreated in 1985, two years after Balanchine's death. Seeing this masterpiece in combination with Chagall's sets and costumes, and the spirited conducting of the top tier players in the pit, it was a performance for the books. Few works can beat its combination of classic and abstract dancing, gorgeous setting and exciting music. Founded in 1962, the Lake George Opera started with two pianos, grew quickly and moved to Glens Falls, where it grew over two decades, adding an orchestra and larger audiences in the process. 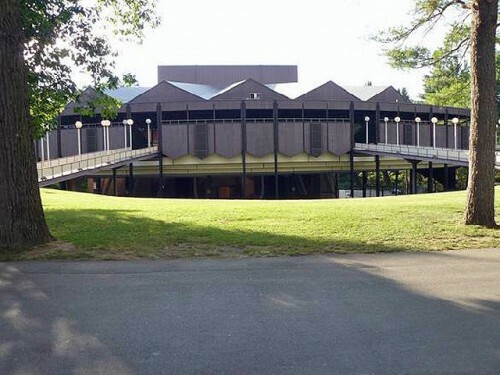 It made its first appearance at the Spa Little Theater at SPAC in 1985 and has returned every year since. This year it undertook five performances of Pucinni's Madama Butterfly and four of Donizetti's Don Pasquale. the Butterfly was especially noteworthy for it casting of Asian singers in the key roles of Butterfly, Suzuki and The Bonze, among others. Soprano Yunah Lee was absolutely perfect as Cio Cio San, with a warm and glorious voice that could melt ice. Her acting was picture perfect, with great subtlety and yet a range of emotion that broke my heart. Of her aria, the one most anticipated is Un bel di (One fine day). But her first act Vogliatemi bene (Love me, please) was heartfelt as well. Pinkerton (Eric Fennell) not only succeeded brilliantly as the well meaning but thoughtless American, but actually looked every inch the handsome young Navy officer that stole Cio Cio San's heart. It didn't take any effort to believe that this was a couple that belonged together forever. Their voices matched as well. His tenor could only be described as full, with a richness that was a joy to behold. As the loyal Suzuki, lyric mezzo Mika Shigematsu was totally convincing, and when she and Yunah Lee sang together the sound was delicious. Baritone Levi Hernandez as Sharpless was super-fine as the US Counsel. In fact the entire cast was well chosen. The staging of the opera - the most popular of them all - was handled by Helena Binder. It was pragmatic, simple and in some ways, rather zen. Yet it produced sharp contrasts between the characters, and the casting of the very young Brady Miller as Sorrow, the child of Butterfly and the American was brilliant. Never before has a child so perfectly filled the role, nor single handedly changed a one hanky ending into a two hanky sobfest. The sight of Butterfly poised with her hara kiri sword, singing Con onor muore (to die with honor) with the child blindfolded and sitting quietly by, while Pinkerton is rushing up the stairs to see her again was almost more than one heart can take. The melding of all the operatic elements creates a moment so intense that any opera lover can not fail to stand in awe of its power. The orchestra under the direction of David T. Heusel was about 30 pieces, and sounded like a hundred. Glorious, just about perfect. Opera has become a very rare commodity in the Berkshires these days. Our resident Berkshire Opera Company has folded. At Tanglewood we have a concert version of Act 3 from Die Meistersinger this weekend, and then a Don Giovanni on July 29. Plus some opera at Bard. 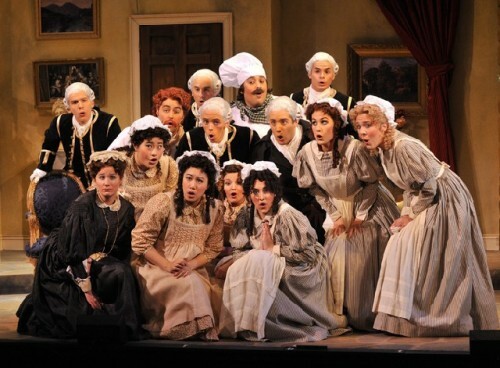 So each summer Lake George Opera provides additional opportunities for opera lovers. Children's Workshops on the Lawn -- July 15, 17 and 18 (matinee) Â– Designed for children age four and older, the workshops explore the connection between movement and storytelling. The workshops, which are conducted by NYCB Principal Dancer Daniel Ulbricht, are a popular pre-performance program the NYCB offers during its regular season at Lincoln Center. Evening workshops will run from 7:15 Â– 7:45 PM. For the matinee, the workshop will take place from 1:15 Â– 1:45 p.m.
Times Union Date Nights -- Thursday July 16 Â– Features of these evenings include a special Date Night 4-pack ticket discount (buy 3 tickets and get 1 free) and fine wine tastings by Beringer Wine Cellars, Placido and Bel Arbor wineries before the performance. Friday Family Night -- July 17 Â– Children and families will be able to enjoy a range of activities including chalk contests, face painting, a magician, balloon animals and free Stewart's ice cream. A NYCB Children's Workshop will also be offered on the lawn at 7:15 PM on these evenings. Girls Night Out -- Tuesday, July 14 Â– This event includes fine wine and gourmet chocolate tastings, along with spa products and treatments, including free massages, yoga, mini mani-pedis from Spa City Spa and Fusion Salon and complimentary hair styling by Rumors Salon. Emma Willard American Girl Night --- Wednesday, July 15 Â– One of last summer's most popular nights, SPAC and American Girl Place Â® New York will host this event which encourages girls to bring their dolls to experience an evening of music, iced tea parties, crafts and special American Girl Place giveaways. A NYCB Children's Workshop will also be offered at 7:15 PM. on the lawn.